Holy Bejeezus, did you Easterners get hit with winter assholery or what? I kept seeing bits and pieces on the news and that looked like Mother Nature’s wrath at its finest (or worst, if you know what I mean). I felt a little guilty, because while New York and Boston lay snowbound, it was sunny and in the mid-60’s in Colorado. Granted, it was windy as heck, but it was warm. So warm, in fact, that we broke a record high for February. One day it reached 72 degrees, which is freakishly warm for winter in these parts. While I was happy not to be shoveling white stuff last week, I have to admit: I absolutely loathe the wind. It makes me feel ferocious and stabby. Our house backs up to the mountains, so there’s really no protection from the wind, so when it’s blustery, it’s blustery in a big way. Our barbecue grill goes flying around the backyard and crashes into the patio furniture, wreaking havoc and making a terrific racket. Even Mozzy, who is almost always happy to frolic outdoors, is not impressed by the gale-force gusts we get at our house. His ears spin around like propellors and it annoys the heck out of him (although it is a comical sight). He comes hustling inside after just a few minutes of that noise. It might sound silly to crave soup when the weather isn’t chilly, but I found myself craving it anyways. I think it’s because those winds kicked up wicked allergies, so I was sneezing and sniffling like someone with a nasty virus. Yet another reason I’m not a fan of the wind. 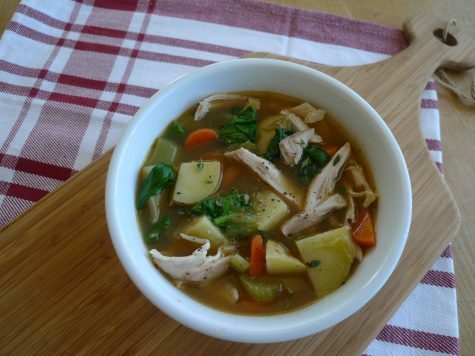 I saw this recipe for slow-cooker chicken and vegetable soup in a recent issue of Cooking Light magazine and had marked it as something to try when the weather was bitingly cold and I needed comforting. Turns out, I needed to make it when fighting a serious case of wind-induced rage. No matter the reason, this soup is worth making because it is, indeed, comforting. 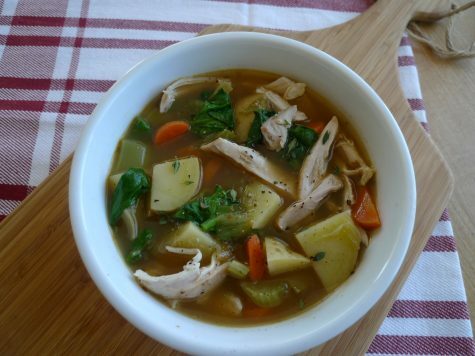 Chock-full of vegetables, potatoes and tender chicken, it’s a hug in a bowl. I was actually surprised how much I loved this soup, because when it comes to chicken soups, I’m firmly on Team Noodle vs Team Potato. My starch of choice for soup is almost always pasta–egg noodles, orzo, rice noodles, small shell-shaped pasta…I love them all. But somehow, potatoes just felt right in this recipe. Heartier and more substantial than a noodle soup. You know what else is to love? It makes a potful, so you can eat off it for days if you have a small family (or a family like ours, where children eschew soup in all forms). 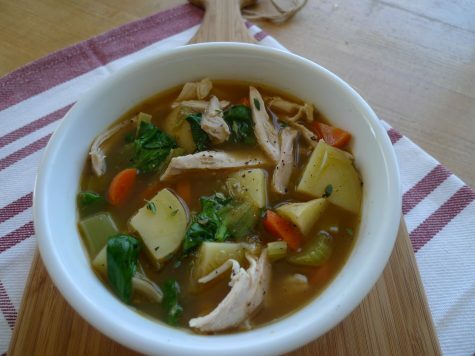 It’s a snap to make, since the slow-cooker does all the work after you chop the vegetables, and the use of bone-in chicken thighs really enriches the broth with incredible flavor. Plus, there’s *ahem* bacon in it. Bacon is magic, pure and simple. So whether you’re freezing your arse off or feeling grouchy or simply needing something nourishing to sustain you, I encourage you to get out your slow cooker and start chopping. I guarantee you’ll feel better once you tuck into that first bowl. Cook bacon in a large skillet over medium heat until crisp. Remove bacon from pan, reserving 1 teaspoon drippings in the skillet. Set bacon aside and crumble. Sprinkle chicken with the seasoning blend. Add chicken to bacon drippings in the skillet and brown over medium heat, about 4 minutes per side. Transfer chicken to the slow cooker, reserving the drippings in the skillet. Add the leek, celery and carrot to the skillet and cook for about 5 minutes. Stir in 1 cup chicken broth and scrape the bottom of the skillet to remove any browned bits. Transfer leek mixture to the slow cooker. Add remaining 4 cups stock, salt, pepper and thyme sprigs to the slow cooker. Cover and cook on low for 2 hours. Add the potatoes, stir, and cover. Cook 2 more hours or until potatoes are tender. Remove the chicken from the slow cooker with tongs or a slotted spoon. Discard thyme bundle. Cool chicken slightly, then cut/shred into bite-sized pieces. Discard bones. Return chicken to the slow cooker to warm through. Add spinach and stir until it wilts. If desired, serve with the reserved crumbled bacon on the top. It seems I’ve been making chicken soup variations almost twice a week around here this winter. Too many viruses and bugs coming home from school! 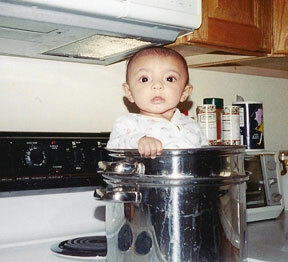 I like the idea of a hearty stew to change it up. Oh gosh, I remember the days when the girls we the age of your girls–they brought home EVERYthing and invariably, I got it, too. Ugh! I’m liking the addition of bacon! I’m a big fan of bacon in chicken soups, as it gives it just enough body to make it a little more interesting. I’m just like you when the weather is warm in winter. I appreciate it, but I can’t help thinking about climate change!